Following on from the very successful launch of The Whitaker Institute Ideas Forum last January, we are pleased to announce the details of next September’s Ideas Forum. 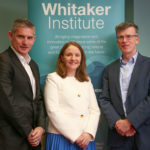 The objective of each seminar is to introduce the research agendas of Whitaker research clusters to the wider membership of the Whitaker Institute and other interested parties from across the University. The next series of the Whitaker Ideas forum will run from 1:00 – 2:00pm on Wednesdays from September – December in CA110, Cairnes Building, NUI Galway.